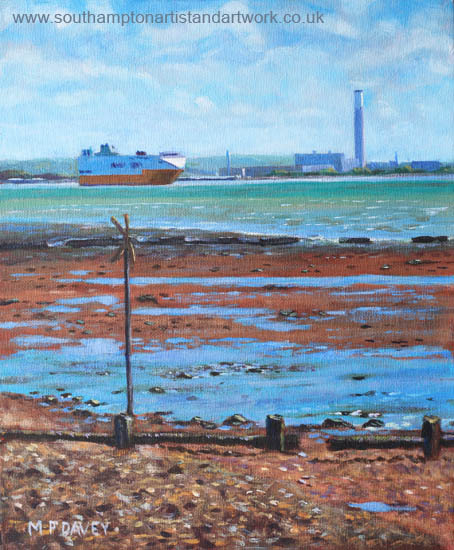 This painting shows the view from Weston Shore, Southampton, looking over to Fawley Power station on a spring morning. Running between is Southampton Water, and a cargo ship carrying cars can be seen approaching the port of Southampton. The tall chimney of the power station is a very distinctive landmark in the area. Behind is the New Forest. The tide is out on the shore revealing various old pipes and concrete blocks. The painting is done in acrylics on a board measuring 10” x 12”, in less than a day. Painted during June 2014.